Participant : Anyone interested in trading. 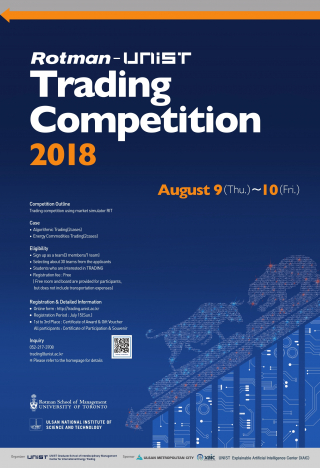 The 2018 Rotman-UNIST Trading Competition is scheduled to be held from August 9 (Thur.) to 10 (Fri.), 2018. The Rotman-UNIST Trading Competition is an annual trading competition using an order-driven market simulator, Rotman Interactive Trader (RIT). This is a joint program, organized by UNIST Graduate School of Interdisciplinary Management and the University of Toronto’s Rotman School of Management. ● Eligibility: Students who are interested in TRADING, Participate as a team (3 members/1 team), 30 teams will be selected. ● Award & Gift Voucher : 1st (900,000 won)｜ 2nd (750,000 won)｜3rd (600,000 won). ※ All participants will be given certificates of participation & souvenirs.